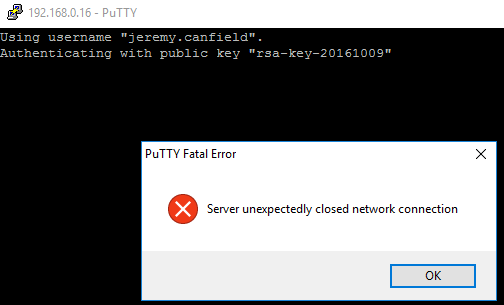 FreeKB - Resolve error "Server unexpectedly closed network connection" Resolve error "Server unexpectedly closed network connection"
This error appers when making an SSH connection to a server using PuTTY. If the server is a Linux SSH server, the server may be configured to refuse connections using nologin. Sign into the server as root and check the nologin configuration.